Today while I was on the porch photographing some of my creations for postarity, a record and for putting them on etsy I watched the mail man walk past my house… no mail today he said. Aah, maybe that is good because there are not bills in my box today. But there is something about mail delivery that makes you feel great. So i went on with my process of photographing things when a neighbor from a few houses down walked up to the porch and said “Hey the mailman made a mistake – here is a letter for you.” A letter…. 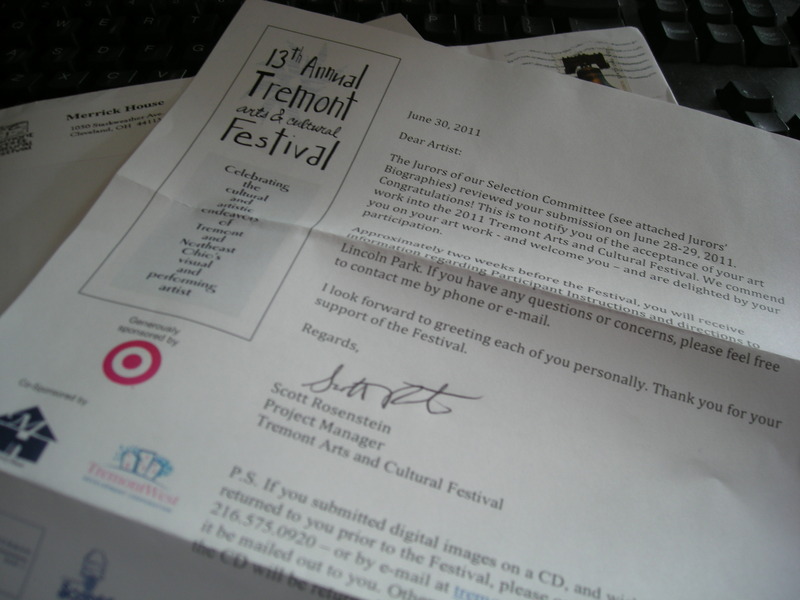 Keep in mind I have been waiting the jury process for Tremont Art and Cultural Festival. Could it be… Envelope said Merrick House. Yes, I think this is the letter. Anxiously I ripped it open to find that I have met the mustard and am accepted as a juried artist for the festival. YEAH!!!!!!!!!!!!!!!!!!!!!!! i love the mail when it brings messages of joy and hope for my future. Thank you God for giving me this great opportunity. Thank you selection committee. Thank you mail man for delivering that message one way or another. And thank you neighbor for being honest and delivering it to me. Fantastic!! Congrats and it is well deserved! I look forward to seeing you at the show. Thank you Tina for your support. I think in my mind I dont feel I have the same base of knowlege as someone such as yourself… without the art school background I sometimes feel insecure about my skills and talents. Thank you for your encouragement. And yes, I think Tremont is going to be an amazing two days. If you are not doing anything saturday I am out in Mantua at the Art on the Hill festival.